Home | Blog | Fresh Altenew Ideas by Jen Rzasa! Fresh Altenew Ideas by Jen Rzasa! Hi friends! Happy Tuesday! Please join me in welcoming special guest Jen Rzasa to our blog today to share two gorgeous projects featuring Altenew products! Read on for more information and enjoy! 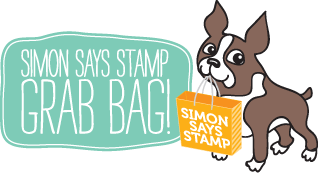 Hi there, this is Jen Rzasa from Altenew and today I have two fun projects to share with you! The first one features the gorgeous Floral Mandala Stencil, which I temporarily adhered to a 4.25″ x 5.5″ white card base with painter’s tape. I then blended ink through the stencil using Maple Yellow Ink in the center, transitioning to Honey Drizzle towards the edges. Once I removed the stencil, my design was revealed! I then selected various colors of enamel dots, from the Pocketful of Sunshine, Red Cosmos, and Cool Summer Night packs. These were adhered in the center of the medallion. To finish off the card, I embossed a sentiment from Stained Glass Window on to a strip of black cardstock with Pure White Crisp Embossing Powder and adhered it with foam tape. I love how the black and white strip contrasts with the colorful background! The second card was quick and easy to create. The background is a piece of confetti paper from the Pastel Dreams 6×6 Paper Pack, which I trimmed to 4.25″ x 5.5″ and adhered to a white card base. 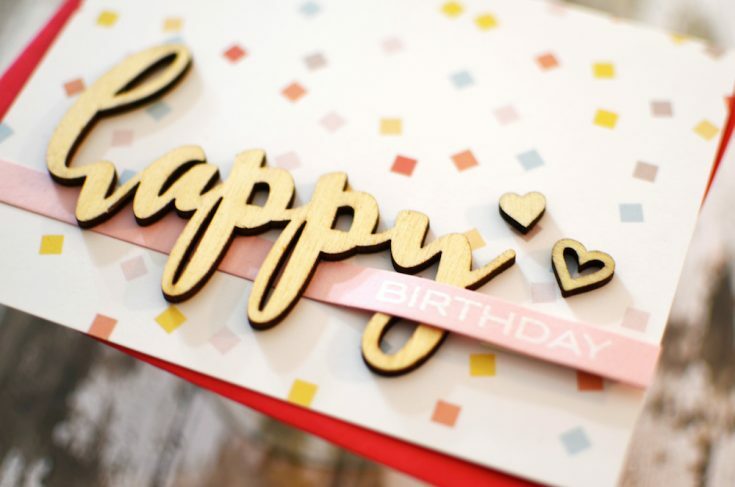 Next, I cut a strip of pink cardstock and embossed the word “birthday” from Birthday Builder using Pure White Crisp Embossing Powder. The following step was a bit fiddly, but I love how it looks! I took the word “happy” from the Sweet Hearts Adhesive Wood Veneer set and placed my sentiment strip beneath the “happ” and allowed it to drape over the “y.” I placed a double layer of foam tape under the right side of the sentiment strip to keep it popped up off of the patterned paper. To finish the card, I added two hearts from the wood veneer set. I hope these projects inspire you to get crafty! Thanks so much for stopping by today and thanks to Jen for being our guest! Gorgeous cards, I love the bright colors on the first card! Bright and cheery card! Love the wooden sentiment on the 2nd. 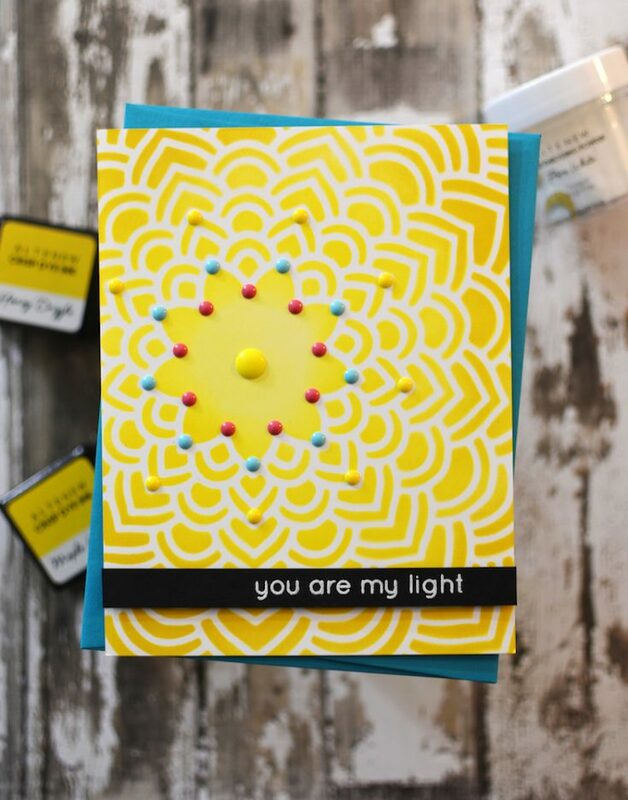 Loved seeing this bright cheerful card. Super cute ideas, Jen. And a great way to use up some gems or epoxy gems. This yellow is so bright and cheery! What a gorgeous card that will certainly brighten somebody’s day. 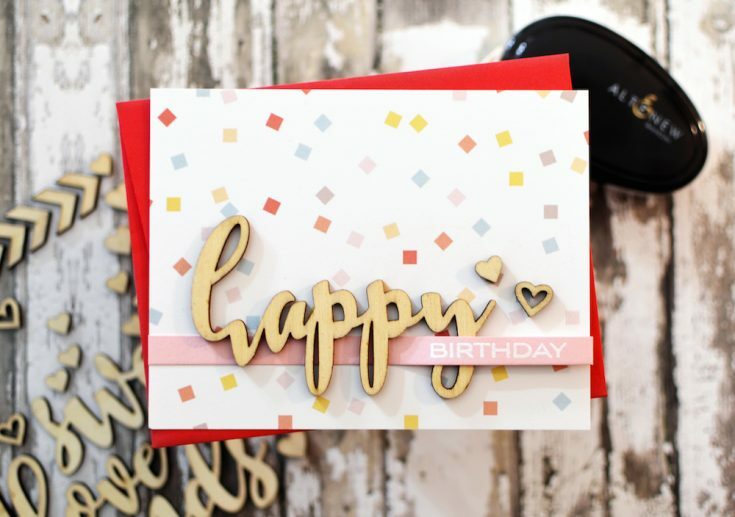 like the way you used the word “Happy” a slightly different twist….like the bright lemon colored card, too! 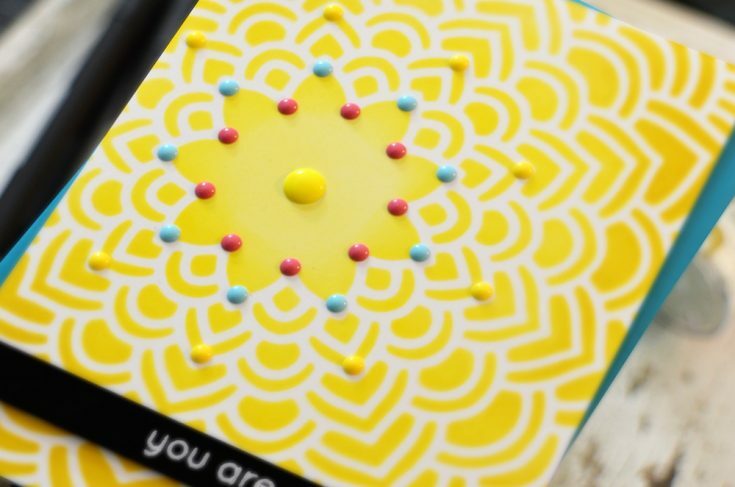 Love the cheery mandala card with the pretty enamel dots, and the way you’ve threaded the “birthday” strip over the “happy” is so effective! Both cards are wonderful, but I am totally in love with the first one. So different and so fun!! Gorgeous cards! Love the colors. I’m so glad stencils are making a comeback. I already follow by email. Love the bright colors. Really nice cards. I love the you are my light card. It is simple, but stunning. Great colours! So bright and happy! Love how cheery the mandala card is! The bright yellow is so pretty, and I like the simple card designs. Fun ideas! Love the sunny first! These are such cool cards! Such beautiful cards, Jen! The first one is gorgeously bright and cheery, and I am loving the way you threaded the sentiment strip through the y of happy. Love the cards, very sweet and bright! I love how you let the stencil shine. Altenew’s stencils are some of my favorites, because they stand alone so well. And I also really like the entwined sentiments; I’m going to have to try that in the near future. Thanks for sharing! Two great cards! What struck me most are those vibrant yellows! Wow! These are just adorable, every single little detail! BEAUTIFUL Inspiration!! THANKS for sharing and have a FABULOUS WEEK!! Beautiful cards and bright colors. Thanks for sharing. These are both fabulous!!! But that first one with the stencil is just stunning! Both cards are lovely but that sunburst card is amazing. So bright and cheery! !